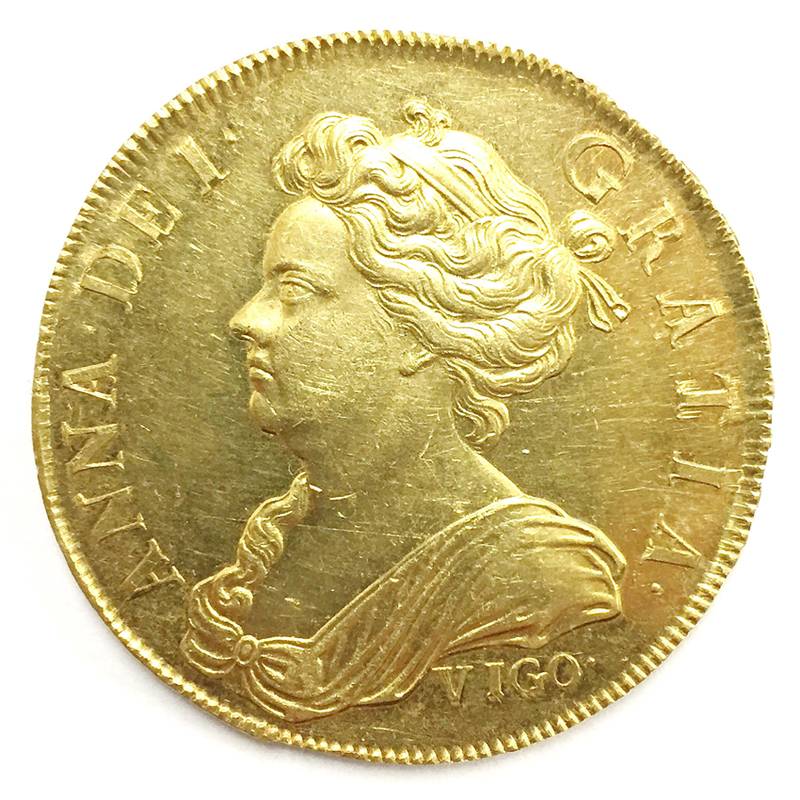 Boningtons have sold a rare Queen Anne 'Vigo' gold coin for £225,000. One of Britain's rarest coins, it was knocked down to a buyer in the room and set a house record for the Essex auctioneers. 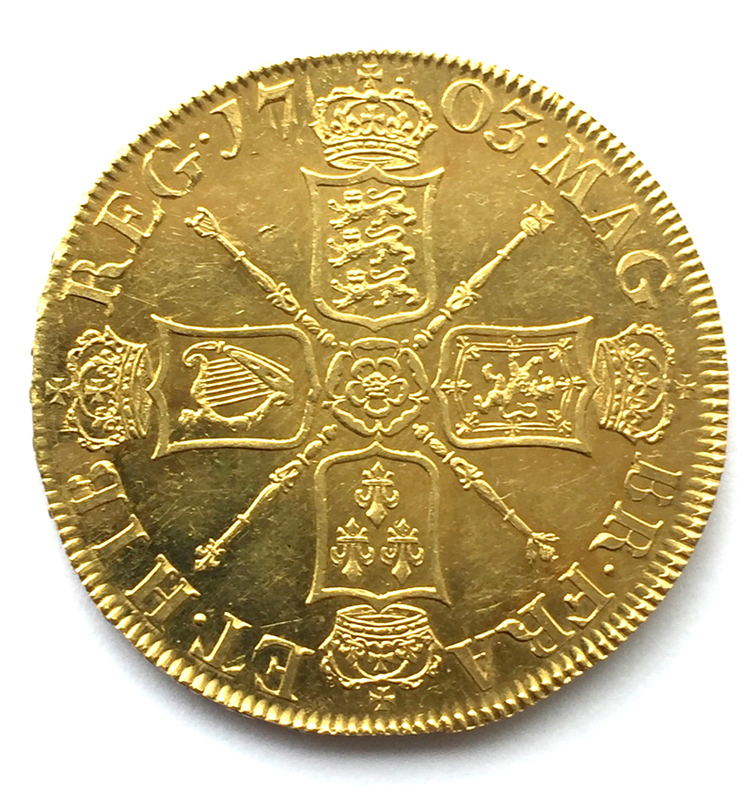 The five-guinea coin was one of only 20 made from gold bullion captured by the British fleet at the Battle of Vigo Bay in northern Spain on 23 October 1702. When the vendor brought it to the saleroom for valuation, it was instantly recognised by Boningtons’ coin specialist Gregory Tong thanks to the ‘Vigo’ mark below the head of Queen Anne. It appeared at the sale in Epping yesterday with an estimate of £200,000-250,000. The local vendor originally had no idea of the coins’ value and had even given it to his four-year-old son to play with as “pirate treasure”. The auctioneers said the coin drew international interest, including a bid from Spain. The winning bid was made by a buyer in the room with the underbidder on the phone. There was a round of applause in the saleroom as the hammer came down and the coin surpassed the previous house record of £203,000 (including premium) for a painting by Sir Winston Churchill that sold earlier this year. The ‘Vigo’ coin at Boningtons was only the sixth example of its type to be offered for sale in the last 50 years. Another example sold for £240,000 at Gorringes in Lewes in December 2012. Spink also sold one in 2005 for £130,000 and another slightly inferior example for £82,000 two years later. Acting as a price comparison showing how the rarity and backstory lifts the value of the ‘Vigo’ coins, a two-guinea Queen Anne gold coin dating from 1713, which was similarly struck but without the ‘Vigo’ mark, sold for £5400 at Knutsford saleroom Wright Marshall last week. The story of the five-guinea gold ‘Vigo’ coins dates back to when the British failed to take the city of Cadiz in 1702. The fleet however managed to seize gold and silver from Franco-Spanish treasure ships coming back from the Americas. Partly to distract attention from the unsuccessful naval operation, the treasure was paraded with full pageantry through London before it was received at the Royal Mint by the Master of the Mint, Sir Isaac Newton. A year later, around 20 five-guinea coins were made from 7.5lbs of gold seized from the treasure ships. The so-called ‘Vigo’ coins have remained sought-after numismatic rarities ever since. The buyer’s premium at Boningtons was 20%.